When the opportunity came up to read and review Shaunti Feldhahn’s newest book “The Male Factor”, I was excited. Previously I had read Shaunti’s earlier work “For Women Only” and benefitted both in my personal and professional life from the information that I gleaned. In “The Male Factor”, Shaunti shares the results of eight years of research and surveys that she has done about men in the workplace and their interaction and relationships with women. The book records some candid thoughts, observations and feedback from men about the unspoken rules that exist. If you are a man, you likely know them and abide by them. If you are a women, there is a good chance you will be clueless. We’ve all heard the adage, “It’s not personal: it’s business.” But as a women, do you really understand what that means, and the implications of approaching work and relationships with that attitude? In “For Women Only”, Shaunti shared how vulnerable and insecure men may be. Male insecurity is not confined to personal relationships, but makes its way into the workplace. Some of those unwritten rules pertain to male insecurity and are addressed in “The Male Factor”. Those rules seem to be in direct conflict to the messages that women are hearing, from other women, on how they can succeed and advance in a man’s world of business. As a result, women often unwittingly shoot themselves in the foot when it comes to their career. They may be taking the wrong approach in working with men, never quite achieving the desired result, but be clueless as to what they are doing wrong. That’s where “The Male Factor” may be valuable to women. Shaunti is quite direct in sharing what men are thinking about women and how women’s actions may effect their business relationships with men and ultimately their career. After working for over 30 years, I wish that I had read this book twenty years ago. If I could have grasped what this book is saying, I may have approached my work differently and achieved different results in my career. Perhaps I would have counted the cost to determine if the sacrifices were worth it to have a successful career. At times I found reading this book quite painful, because I see how many mistakes I foolishly made. Hindsight may be 20/20, but there are no mulligans in real life. If you are just getting started in your career, or are working hard but not seeing the results you’d hoped, you may benefit from the information shared in “The Male Factor”. I continually had to remind myself that Shaunti wasn’t necessarily advocating the prevailing attitudes, but was instead letting us know what’s really going on. In the politically correct world that we live in, you are not likely to have male colleagues share as openly as Shaunti has about what’s going on in a man’s mind in the workplace. 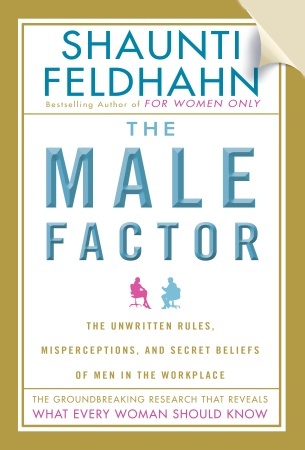 I recommend “The Male Factor” for women who want to learn about men in the workplace and to equip themselves with strategic relational skills to succeed. I would even recommend the book for men because Shaunti does go into how women think and relate which is much different from men. Overall the book is well written and interesting, albeit slow in the beginning The first two chapters were rather tedious, but once you get into the meat and potatoes of the survey results you get valuable insight and information from men in the workplace. As a Christian, my favorite chapter was the last one “Putting It in Perspective”. Shaunti has compiled counsel from Christian women talking about how they work and interact with men in light of their Christian world view and putting Christ first in all things. « God’s Talking…Am I Listening?